Thanks for picking up on the discussion. 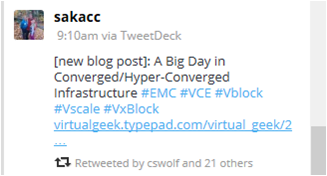 The post has raised the volume of conversation around HCI deployment considerations. I think it’s OK that we don’t see eye to eye on the market opportunity; ultimately the market decides the areas of mass adoption and doesn’t care much for our opinions. My recent blog emphasized two topics and should have raised a third (I guess a follow on is imminent). I have long stated that there are many deployment scenarios that a storage array makes little sense like branch offices and mobile service vehicles. My apologies if my perspective stands in contrast to the goals of Nutanix but I would think you are in full agreement with my premise: HCI is a better option in these scenarios than a low-end storage array. My second point was asking whether the low hardware utilization of HCI (which is based on shared-nothing architectures) limits their ability to be viewed as an enterprise-class storage infrastructure platform. I suspect we may debate over the term infrastructure more than the HW utilization of the platform. History has shown us that efficiency drives down cost and cost is a constant consideration in every IT purchase. When I take a step back I think the bigger topic to discuss is what problems does HCI – or any next-gen technology – solve? I stated a clear market need currently underserved by the storage vendors. Looking at enterprise-scale infrastructure needs I would imagine we agree on areas of need like reduction of acquisition costs and the simplification of operations in order to scale. HCI can deliver in these areas but it seems limited when the scope is expanded to included a broad set of applications, network fabrics, physical host connectivity, etc. All products have limitations, so please don’t take the above comments as a knock on the Nutanix platform; however, such limitations guide my perspective as where HCI are viable alternatives to traditional storage models. If you’re saying Nutanix can service all of the market needs today than my blog post stands in error, but I don’t think you would make such a statement. I wish all of the best to my friends and Nutanix. You have established a new market and I foresee more disruption in your future. Go forth and help customers! First of all – deep apologies for approving this comment so late. This is a fairly new site for me, and I just didn’t notice it. I hate when people delay posting my comments for even an hour – so I’m really embarrassed about my oversight. I wouldn’t feel quite as bad if your comment was snarky or ill conceived, but it was obviously very well crafted and considerate. You already know that I’m a fan of yours. I am also a fan of Pure Storage. I think Pure has done a phenomenal job in making so much traction so quickly in a very competitive industry. Your simplification of storage administration is extremely impressive. If I were a customer and was going to purchase an array – it would be Pure. I even recommend Pure to customers who need storage for physical workloads. When it comes to virtual workloads, however, we’re now at the point where I think almost all are a good fit for Nutanix. We have Fortune 500 customers moving their virtualized SAP, Oracle, SQL and Exchange workloads over to Nutanix. Our reference site includes organizations such as Empire, Serco & St. Luke’s. But at the end of the day, it is great that early stage companies such as Pure and Nutanix can make headway into the legacy storage market so dominated by a handful of datacenter giants. Clearly we’re delivering value to customers, and to our channel partners who recognize the opportunity to differentiate their businesses by evangelizing a superior solution. I really thank you because I think this discussion is really valuable, above all for people like me that are trying to understand this concept for a long time. Ok understood that in your opinion Nutanix is very good for virtual (and even I’m not an expert, I agree with you) but, in your opinion/experience, could Nutanix completely substitute a traditional storage array at least in some environments? I read the article about the network challenge and I confess you that I never tought about a simple and obvious thing like that (…only 2 drives to saturate a 10GbE ethernet network …). Thanks again Steve, your blog is really realy useful!